Enjoy full control over what’s going on, simple single-hand operation and a practical ergonomic design. It may sound like the description for a remote control, but it is also applicable to the mobile computer Datalogic Memor X3. It makes working a pleasant experience and sits as comfortably in your hand as a remote control. 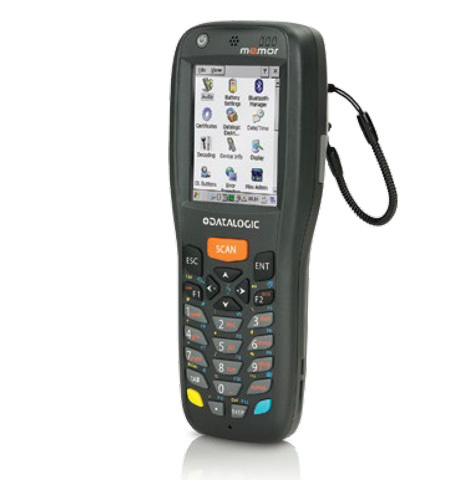 This robust handheld terminal was specifically designed for applications in wholesale, retail, warehousing and field service and is based on the successful Memor mobile computer. Its excellent ergonomics and light weight protect the user from fatigue, while the long-life battery lasts an entire shift. Using the Windows CE 6.0 Pro oder CE 6.0 Core operating system you install the most varying of applications onto the device. Handling is further significantly simplified using either the keyboard or the touch screen. The new wireless communications options (a/b/g/n Wi-Fi and Bluetooth) make the Datalogic Memor X3 an ideal companion in both retail and logistics. With measurements of just 15.6 x 5.7 cm and a weight of approximately 230 grams, the Datalogic Memor X3 is no larger or heavier than a remote control. Yet despite this the minicomputer offers full functionality for data capture. According to the application choose either an integrated laser scanner or a linear imager for 1D barcodes. For 2D applications with higher resolution and image capture, there is also an area imager available. All barcode readers naturally feature the patented and highly practical Datalogic Green Spot good scan confirmation. Additionally take advantage of the pre-licensed PAL software and easily adjust the data capturing process to your needs. The fast XScale PXA 310 processor with 806 MHz or 624 MHz ensures for even greater performance. Additionally, 256 (or 128 MB, respectively) RAM and 512 MB Flash memory provide additional security when saving both user and program data. The easily accessible SD card slot increases the memory up to 32 GB. Connection to all existing systems occurs one of three ways: the basic version works offline as a mini computer with memory. Data transfer to and from the device occurs via the integrated standard interface via cable (USB). For a professional online connection to inventory control systems or databanks, the Wi-Fi variant with internal IEEE 802.11 a/b/g/n radio module is recommended. This way, you realize a real-time integration into every company network without difficulty, even over a large area of outdoors. A version with Bluetooth interface is also available. With its high technical performance and versatile options, the Memor X3 is robust, yet at the same time equipped for operation in rugged environments. Additionally, the device is protected against water and dust penetration (IP54 certification). Its broad operating temperature range of -10 to +50°C allows for both indoor and outdoor operation. Receive the Memor X3 as a ready-to-use kit, including battery, standard. The power supply and cable for USB data transfer are also included in the scope of the delivery. The Memor X3 is backwards compatible, so that you may continue to utilize existing cradles and accessories from predecessor models, to minimize your investment costs.